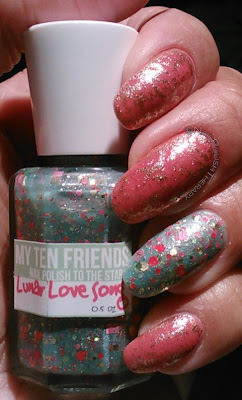 Nail Polish My Ten Friends Lunar Love Song, When I first saw Lunar Love Song I thought it was a lighter version of Pew! Pew! Pew! but it completely is not! I had every intention of polishing all my nails with this color but honestly I didn't want to waste it. By far Lunar Love Song and Dirtball are my favorite of MTF. 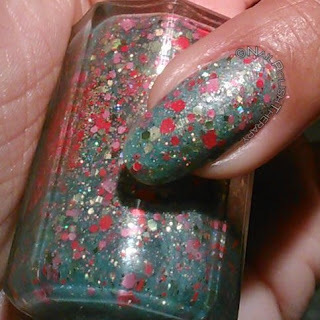 Lunar Love Song is a very light teal base with orange, pink, red, and gold hex glitter. 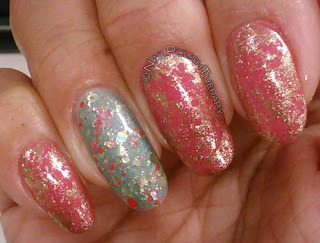 I love this polish because it's sweet, fresh, girly, and a great spring or summer color. The rest of the nails I used OPI My Address is Hollywood with Zoya Ziv sponged on top to compliment the color combos in Lunar Love Song. 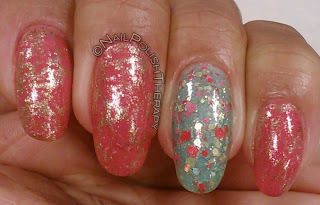 Check out all the other polishes in the Kiss of the Cosmos collection at MTF shop here. Thoughts? Feelings? Concerns?